you may ask what we do at night? 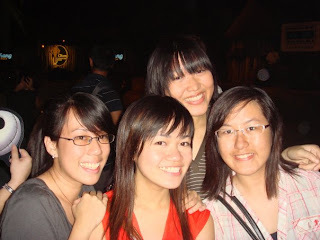 hmm for e 1st night...Fey, Xiwen, Elizabeth, Song and i watched "Battlestar Galactica" series from 10.30pm to 6.30am. we're not supposed to sleep during work, but we were too tired and fell asleep while watching e show at around 5+am!! we even used our 45mins breaks to take naps in e aircon room! and, thanks Pierson for buying mac supper for us!!! for e 2nd night, Xavier brought Masrin, Lawrence and i to site. we had a night site-walk and then stayed in e BSG lead-room to read e BSG manual for e rest of e night! 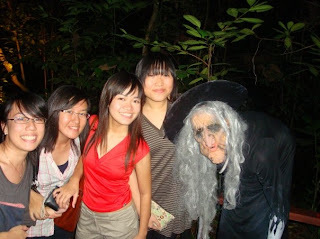 at about 1.30am, we went up to e peak of e coaster to have a short break! i simply love standing up there...no sun, just e cold breeze and e night scenery of e park!! what we could have been, 11:14 AM. 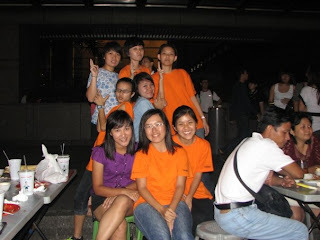 anyway had a BSG gathering on 29th nov (last sun). BSG stands for battlestar galactica, the duelling coaster in Universal Studios Singapore. i've been helping with the testing of the coaster, and my manager wants us to gel with the part-timers (who are fixed to the attraction but full-timers still don't know where we'll be fixed at), so we had dinner at Lau Pa Sat. 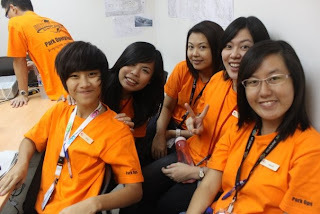 more than half of us worked that day. 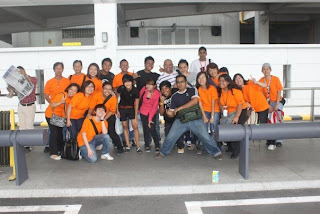 not just the crew, my team manager and area manager also came for the gathering. 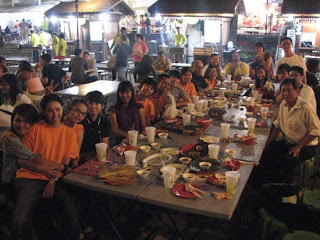 when we reached, there were already alot of food on the table but the main highlight was SATAY!!!!! 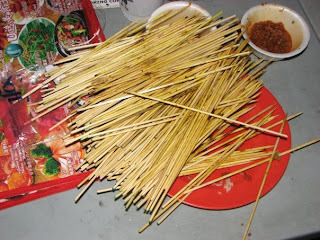 lol fyi, 22 of us ate 350sticks of satay!!! what we could have been, 11:43 PM. 2weeks+ since i last blogged!! i always tell myself on every off-day that i want to blog...but i end up being so lazy to do so!! i'm going out to e site more often than previously...almost everyday now!! and yes...i've became more tanned!!! i worked e next day (yes on a sunday! )...and i don't know for what reason, 1 friend brought her cam so we took many photos! in case you're wondering what we do in office on sundays...we watched Madagascar 1&2 for e 1st week, watched Final Destination 1, 2&3 e week after, were allowed to go out and get KFC for lunch on e 3rd week, and bascially just slacked our way through with games and stuff for e 4th one!! haha slack huh? many people are saying...seems as though we're paid to watch movies on sundays! lolx oh btw, e 2 group pics below are not full-strength!! 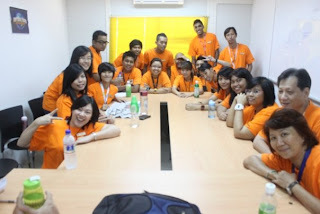 my batch has 42 of us but only 20+ worked on that day!! what we could have been, 12:13 AM. what we could have been, 1:09 PM. in this programme, we learnt about RWS, safety, interaction with guests and most importantly, working as a team!!! we played a few team-bonding games these 2days....the last game we played this afternoon was the most challenging. despite failing many times, we never gave up and continued till we succeeded. and because of our many failed attempts previously, success tasted especially sweet at the end!! starting from tomorrow, we'll be training at RWS in sentosa itself. *yes! no more long journeys to jurong east. haha* although the next few months will not be easy, but i'm sure this's gonna be an experience which i'll never ever forget!! 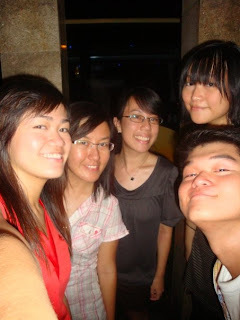 and with this batch of friends whom i'm trained with, i can foresee hell loads of fun during training and at work!! what we could have been, 11:04 PM. i'm officially an attractions crew of Universal Studios Singapore!!! 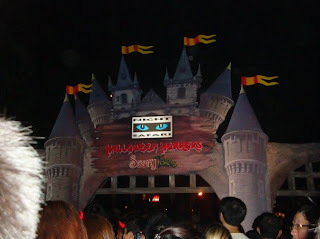 i've been to a few themeparks in japan and korea, and it was then that i wish to work in a themepark. *fun environment, interaction with people etc. * it's not some big dream, but i'm still glad that my wish came true. the pay isn't high (at least compared to e pay given to me by marina bay casino), but i know for sure that i'll love it. what we could have been, 6:38 PM. what we could have been, 12:53 AM.